and that must mean something. I don't care what anyone says, I like the realistic stories ERB wrote. He wrote them before they shut him down in this type of story at the beginning of the twenties. Two of my favorites are Bridge And The Oskaloosa Kid and this one, The Efficiency Expert. The two might be called his Booth Tarkington stories. One of the most successful authors of his time, Tarkington was cresting in 1919 when ERB wrote this charming story in such an offhand manner. One may argue whether Burroughs was a great writer qua writer which many deny him but I really have to believe that this novel is so skillfully done that one isn't aware of the artistry ERB took pains to conceal so that the story reads naturally. I maintain that this novel is among the best and most skillful he wrote. Amazingly he wrote it in ten days. There were a total of eleven Tarkington titles in the library including Penrod and Penrod and Sam which are reflected in the Oskaloosa Kid, also he had Seventeen and The Magnificent Ambersons, all four of which retain some reputation today. Another novel, The Girl From Hollywood was closely modeled on The Magnificent Ambersons with strong William Makepeace Thackery overtones. Almost like describing fine wine isn't it? 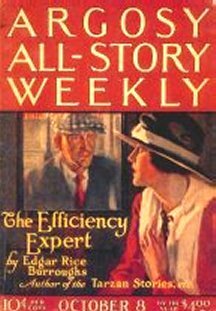 The Efficiency Expert is a wry look back on ERB's hopes and expectations as a young man when he attributed his fumbling beginnings to inefficiency. I have trouble with his use of the term efficiency. I'm not sure I understand it nor am I clear on when ERB became 'efficient.' The only period of his life when he was efficient that I can detect was his period at Sears, Roebuck. Sears was of course one of the most efficient institutions ever organized. 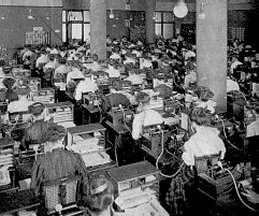 ERB's role in the Stenography Department was his only efficient period. He did learn efficient paper management there which undoubtedly helped in his writing career. ERB always regretted never having attended Yale like his brothers and his friend Bert Weston. He would have liked to have graduated but as he didn't and managed to succeed anyway he now takes a swipe at college diplomas in Jimmy Torrance who despite his diploma falls from the top to the bottom. This symbolically reflects ERB's career. Born a Prince, in his own imagination anyway, he was turned out from the castle to live the first decade of the century as a pauper. He was able to reclaim his role as a prince when he began writing but I suspect that role was unacknowledged by his contemporaries who continued to see him as a clown and goof. I think I will tackle the story chapter by chapter as the plot moves forward step by step. It was almost as though he were writing a book to be adapted to a movie. It would have made a good one. 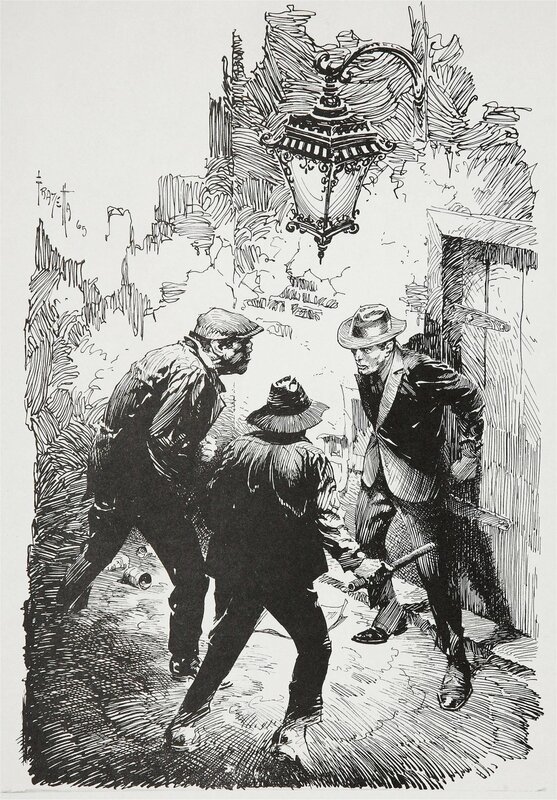 The story closely resembles Burroughs' own career until Torrance obtains the job with the International Machine Co. and the subsequent murder charges. Torrance's college career closely parallels ERB's school career with the exception that he attended the Michigan Military Academy rather than 'one of the oldest and most famous colleges in America.' One presumes he means Yale. Torrance's academic performance was on a par with that of Burroughs. Both concentrated on athletics as well as being popular to the detriment of their grades. Both were football stars. Torrance also excelled at Track and baseball also being the college's champion heavyweight boxer as an add-on. Torrance's last battle was an apparent recap of the Jess Willard-Jack Dempsey fight on July 4th 1919. 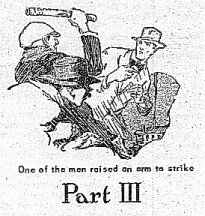 The novel was written in the incredibly short period of September 10-19 a few months after the fight. Torrance who was much shorter than his opponent and lighter as was Dempsey who nevertheless finished Willard off in four rounds as did Torrance to his Freshman opponent. After the fight Torrance is informed that he will fail if he doesn't shape up which he does. ERB was asked to leave the Phillips Academy and he may have had to cram to graduate from the MMA. You have graduated - I didn't thinkyou would - with honors in football, baseball, prize-fighting, and five thousand dollars in debt. How you got your diploma is beyond me- in my day you would have got the sack. Well, son, I am not surprised nor disappointed - it is what I expected. I know you are clean, though, and that someday you will awake to the sterner side of life and an appreciation of your responsibilities. To be an entirely orthodox father I should raise merry hell about your debts and utter inutility, at the same time disinheriting you, but instead I am going to urge you to come home and run in debt here where the cost of living is not so high as in the East - meanwhile praying that your awakening may come while I am on earth to rejoice. Am enclosing check to cover your debts and present needs. God, what a crusher. Utter inutility indeed. One assumes that the closing ''Your affectionate, FATHER" was either sarcastic or ironic. One wonders whether ERB received some such notice when he graduated from the MMA. Perhaps such a response may have influenced him to abandon the MMA and join the Army in an attempt to please dad. But then, all too soon it was Hey Dad... and a confirmation of his utter inutility. After the Army ERB did return to Chicago and go to work for his father while Torrance rather than submit to this fate worse than death elected to go to Chicago to try his fortune where he always had an idea that 'that was one burg where I could make good.' Probably what ERB thought too. Once again there is a connection to ERB's friend Bert Weston as he places Torrance's home town in Beatrice, Nebraska where Weston lived. After all, Weston went from the MMA to Yale, actually had an officer's appointment in the Army and was a successful businessman with his corn mills. Sort of a successful alter ego for ERB. In a charming Tarkingtonian manner ERB describes the follies of a young man starting out in live. How much Torrance's methods reflected his own is questionable but they ring true to the facts of ERB's own life. In 1919 ERB was forty-four years old, this was written shortly after his birthday, so perhaps he could write such a heart breaking letter as Torrance received from his father without breaking down, or perhaps he did break down. His own father had lived to see his wayward son at least attain the success of being published in pulp magazines which were considered much less than literature. Still success of some sort. One wonders what the old boy's true reaction was. Perhaps a - humph. At any rate he had been gone for six years when ERB penned this one. 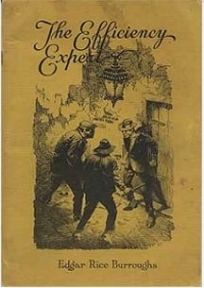 The eight years from 1911 and A Princess Of Mars to 1919 and The Efficiency Expert had been momentous ones for ERB. His life and emotions had been highly compressed from 1887-88 when he met John the Bully on the streetcorner to 1911 when he began to write. The eight years of writing had been years of decompression as he expanded his identity from that of the absolute pauper circumstances had made him into his proper identity as a Prince; a voyage from The Mad King of Lutha to Barney Custer of Beatrice, Nebraska. It should be apparent that he longed to be like his ego substitute Bert Weston. From a baby disinherited from a noble heritage born to the purple to a jungle beast and the return to Tarzan, Lord Of The Jungle. From a prince to a pauper and back again. You can hear the plot of Twain's Prince And The Pauper running in the background. Now, in 1919 he was on the verge of leaving Chicago forever. He was leaving in defeat having failed to make it in that burg. Even though a successful writer he was still rejected. Perhaps The Efficiency Expert was both a justification of himself to Chicago and a farewell. As he begins his life in Chicago Torrance in the absurd confidence of youth believes that employers will be fighting for his services to run their companies for them. They must have had a good laugh in reading his ad in the paper offering his services as CEO. Perhaps when ERB returned from Idaho in 1904 he did the same. If so Torrance had the same result. Abjuring turning to the assistance of 'rich and powerful friends' he decides to go it on his own. "I should think," said Jimmy, "that a man of your ability could earn a living by less precarious methods." "You would think so," replied the Lizard. "I've tried two or three times to go straight. Wore out my shoes looking for a job. Never landed anything that paid me more than ten bucks per, and worked nine or ten hours a day, and half the time I couldn't get that." "I suppose the police hounded you all the time, too," suggested Jimmy. "Naw," said the Lizard, "dat's all bunk. De fellows that couldn't even float down a sewer straight pull dat. Once in a while dey get it in for some guy, but dey're glad enough to leave us alone if we leave dem alone. I worked four hours today, maybe six before I'm through, and I'll stand a chance of makin' all the way from fifty dollars to five thousand. Suppose I was drivin' a milk-wagon, gettin' up at t'ree o'clock in the mornin' and workin' like hell - how much would I get out of dat? Expectin' every minute some one was goin' tuh fire me. Nuthin' doin'- dey can't nobody fire me now. I'm my own boss." As Burroughs says it depends on your point of view but Lizard's logic was OK. If you don't mind being a crook. Burroughs delights in showing off his knowledge of underworld argot which one assumes he learned from books. I'm sure everyone knows but for those who don't a dip is a pickpocket and a cracksman is a burglar and in Lizard's case a safe blower. I learned the terms from books. In his realistic novels ERB got a chance to use different vocal mannerisms and dialects which he studied carefully. Thus he makes his characters speak true to type. 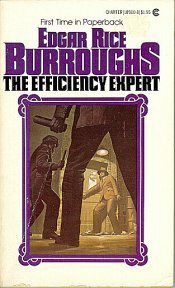 As a panorama of Chicago social mores of the time The Efficiency Expert is a fairly significant literary contribution -- this is a good Chicago novel, not inferior to those of Nelson Algren. Torrance obtains his own first job as a sales clerk in the women's hosiery department of a department store. Thereby begins a series of coincidences which hold the story together in a fairly clever manner advancing it at the same time. He waits on two beautiful women, Elizabeth Compton and Harriet Holden. Bearing in mind that Torrance is exceedingly handsome, for some reason I picture Richard Harding Davis, a big burly heavyweight boxer and all around athlete. He probably put the shot in Field & Track although Burroughs doesn't say so. Jimbo is humiliated at having to wait on these women who are of the class from which he has descended. In a fit of pique he quits putting him back on the street. Now begins a fairly intimate relationship with the underworld. The Lizard obtains a job for him as a waiter at a Levee dive called Feinheimer's. This place is based on a real joint in the Levee so that ERB is displaying a fairly profound knowledge of the underside of life. It is quite possible that he is just making it up from general knowledge but, maybe not. From 1905 to 1913 ERB was associated with mostly quasi-respectable businesses except for Sears. He seemed comfortable with them too. The patent medicine business with which he was associated may perhaps not even be considered semi-respectable. The police and authorities might even knock on the door from time to time. One might develop a negative attitude, such as ERB displays in this book toward the police and law enforcement. One might even develop a cynical attitude toward the thin line between legal and illegal businesses such as ERB seems to have done in this novel. 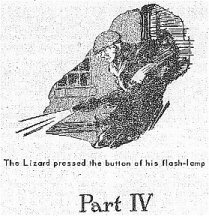 The Lizard expresses the notion in words similar to those given to Pretty Boy Floyd the Outlaw by Woody Guthrie: 'Some will rob you with a six gun; some will use a fountain pen.' I know that's true from my own experiences. ERB seems to concur in this evaluation and for myself I've never found better words to express it. Apart from Dr. Stace, with whom ERB formed a partnership, and his patent medicines, ERB was of the class of businessmen who rented corners of other men's offices. So those companies he had probably were running on the shortest of shoe strings. While not illegitimate the practices of some of these people, often sales organizations, would not draw the applause of 'respectable' bankers who are of the fountain pen variety. For an excellent portrayal of these guys most of which like ERB were hanging on by the skin of their teeth before they bankoed out again see John Dos Passos' excellent 'The Big Money' of the USA trilogy. When ERB wrote Emma from South Bend he must have been on some such selling expedition. 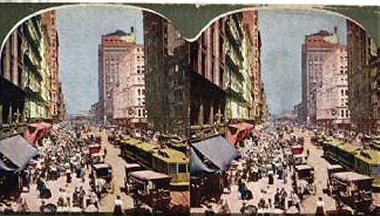 It should also be borne in mind that his father's offices were on Madison Avenue which was Chicago's Main Stem and by extension the Hobo Main Stem of America. Burroughs writes frequently of hoboes so that he must have become very familiar with them and their loose interpretations of the laws of the land. While at Feinheimer's Jimmy meets Little Eva who is the proverbial golden hearted prostitute. Little Eva of the golden heart is contrasted favorably with the very respectable but cold hearted Elizabeth Compton. Torrance runs into her again at Feinheimer's where she is an unescorted woman in the evening. She and Harriet are slumming it. Just as respectable people would later be fascinated by Al Capone and other hoodlums so in this era respectable people got a thrill out mixing with the demimonde down in the Levee at semi-respectable joints like Feinheimer's. This gives ERB an opportunity to express his opinion of labor leaders. Steve Murray, the head of some union, is in attendance. He hangs out at Feinheimer's and most likely even lower joints indicating the relationship of criminals and union leaders. As these beautiful girls are unescorted it is not unreasonable to suppose they are of loose morals or they wouldn't be at a place like Feinheimer's, now would they? Murray acts accordingly in the coarsest manner. Our erstwhile heavyweight champion of one of the oldest and most famous colleges in America comes to her rescue by decking Murray. He's on the street again, unemployed and looking for work. However some boxing enthusiasts note his fancy footwork and offer him a job as sparring partner for Young Brophy an aspiring champion. Torrance is exploring every level of society as a declassed prince and actual pauper. Here ERB brings in his boxing interests which show up repeatedly in his writing making free with the comments on the fight game. He apparently believes, and why not, that most of the fights are fixed. If Young Brophy refers to any real event it may refer back to the Jack Johnson-Jess Willard fight which it was believed, almost certainly correctly, that Johnson threw. Maybe ERB lost his bets on that one. Still had hard feelings. At the same time Johnson was about to return from exile to serve time on framed up charges. He might have been on ERB's mind especially as Willard had just lost the championship obtained at Johnson's expense. Jimmy and the other sparring partners are supposed to make Young Brophy look good in an attempt to set up good odds in his favor since he intends to throw the fight. Jimmy has no problems with this until Brophy sucker punches him with, who else, Elizabeth and Harriet looking on. A couple of gentlemen friends brought them into this sleazy environment. Thus ERB once again calls attention to the short distance between the respectable and unrespectable. One begins to think that his early reputation was following him around and he just wanted to say that people who live in glass houses shouldn't throw stones. Rather than be embarrassed in front of the girls in the next round Jimmy gives Brophy the old one-two and thereby is out on the street again. Getting a start in life's game ain't easy. Here comes Lizard again with another job as a milk truck driver. Wasn't good enough for Lizard but it's honest and Jimmy accepts it. Nice the way ERB ties all the details together though. You should read this one a little carefully. Rather than being sought after by the Captains Of Industry Jimbo's career is on a steady downward drift. One wonders if the pauper will ever be a prince again. It is not looking good. Ex-milkmen usually don't rise to CEOs. Come on, do I have to tell yez? A fourth coincidental encounter. Liz is disgusted but Harriet knows that Young Jim is a declassed gentleman. The milk truck drivers go on strike so Jim loses that one. Now Torrance is really down and out but encouraged by the Golden Hearted Prostitute, Little Eva and her loan of a hundred dollars to buy him a brand new suit, anybody ever hear a tune called "Frankie and Johnny," Torrance applies for a job as an Efficiency Expert in his new suit. OK, here we are, the story. One is inevitably reminded of ERB answering the ad for the expert accountant. He may say that he had no idea what an expert accountant did but then, on the other hand, he had been the treasurer for the American Battery Company at one time. Even though he worked for his dad pop expected him to shoulder some duties. Treasurers have to have some familiarity with a bookkeeping and accounting so I tend to discount ERB's wide eyed protestations that he didn't even know what an expert accountant was. I think he knew his way around a little bit, he kept the job for over a year, but it made a good story. Even Jimmy says he'd watched efficiency experts at his dad's plant in Beatrice so he had some idea of what they did. Jimmy has enough sense of accounting matters to figure out that someone is pilfering the payroll. ERB had to know something of accounting to include that detail. At this point ERB gets to use one of his favorite ploys. He was fascinated with "How To" books. Indeed he himself wrote a "How To" sales manual. Little Willie Case of the Oskaloosa Kid has his copy of "How To Be A Detective." Now Torrance buys a second hand copy of "How To Get More Out Of Your Factory" for a quarter, which seems kind of high but was a good 'investment' as he gets the job. Now, who do you think employs him? That's right. Elizabeth Compton's father. Jimmy sets to work and does a good job but he is opposed by Bince who is Elizabeth's fiancee while being groomed to take over the business. He has a bad gambling habit, which in today's drug related culture would be called an addiction, so that he is stealing from his future father-in-law to cover his substantial losses as he naturally is being fleeced. We know that ERB knew something about card rooms so in a marvelously few words he captures the characters and ambiance very convincingly, almost one might say effortlessly which is to say in such a natural manner that his art is concealed which we are told is the essence of good writing. What do you think? In order to meet his obligations and gain control of the machine works Bince has Compton murdered while pinning the blame on Jimmy. ERB brings Steve Murray in again which allows him to take a swipe at his bête noire the I.W.W. Jimmy is duly arrested and put on trial. This scene is fairly reminiscent of the ending to The Girl From Farris's which it is my intention to tackle next. 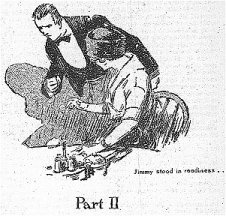 Harriet clandestinely provides him with an attorney who although one of Chicago's best conducts an inadequate defense of Jimmy. Poor Jimmy is going down for the count, although his attorney has been well paid, of course, when the lizard comes to the rescue providing the evidence which exonerates Jimmy while pointing the finger at Bince. Bince rushes to the window taking a header into State Street four stories below. Steve Murray remained cool and probably got off although Burroughs says nothing about it. Thus Torrance's life is pretty intimately bound with if not the underworld at least the demi-monde. Since ERB was safely out of Chicago when he wrote this he may have been making some comments on the nature of Chicago society in general. As I said before the line between the legal and illegal was pretty thin. ERB had walked the line pretty tightly in his early career which may have been held against him when he succeeded. But as he never crossed the line he may be making some acerbic observations in return. As Burroughs was now out of Chicago one wonders if what he was saying is that he too was innocent of any and whatever Chicago may have been saying about him. He must be saying, like Jimmy Torrance, I am innocent. I didn't do it, whatever it was. But ERB did do it. He had been thrown on the discard pile but he wouldn't stay discarded which is a sin in itself. He took Emma from Frank Martin. 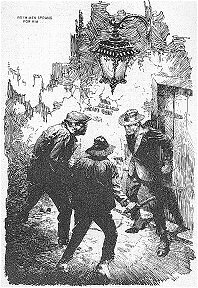 I have yet to discover who the Martins were and how much influence they had but one gets the impression that ERB thought he was being pursued in which case he probably was. Taking Emma was an offence which the Martins certainly wouldn't forgive and possibly in sympathy a large swath of upper economic class Chicago. If this is true they were probably infuriated when ERB escaped them to make it big. This in turn may have been a partial reason ERB took extended vacations to California in 1913 and 1916, now in 1919 fleeing the city for good in which he had once hoped to be successful. There were plenty of good reasons for moving to California and, as far as I'm concerned, none for staying in Chicago., but still ERB had wanted to triumph there. It was not to be. The city still doesn't acknowledge him. For that reason I believe The Efficiency Expert which more or less recapitulated his years from 1904 to 1913 was his farewell to his home town. He would make one more reference to the years spent in Chicago in his Bandit Of Hell's Bend and then he moved on. 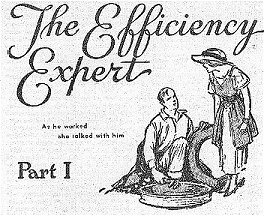 Nevertheless, The Efficiency Expert is a pretty good novel of Chicago life probably before 1913. The question would be how much of the information was obtained first hand and how much was distant observation and hearsay. After all he didn't have much money in those years, he couldn't have done much. The idealized criminal Lizard seems a little romantic while the Golden Hearted Prostitute also seems a stretcher but ERB frequently displays little snippets of experience that can astonish, such as in The Mad King he tells us of being on a Chicago street examining a hole cut in the window of a jewelry store with a diamond by a burglar. Could it have been the Lizard? He incorporated that detail in his story. A good imagination can do wonders with the slightest of details. Imagination and observation were in plentiful supply with Our Man In Tarzana.